Hey Charlie. Thanks so much for taking on my “assignment” of writing about lefties. I really appreciate you addressing a topic that I’m pretty sure you’ve never covered before. Very interesting! Us lefties get no love at all by the guitar makers. You go into any Guitar Center and there might be 200-300 guitars but only 1 or 2 lefties (and they’re usually the lowest quality in the line). So hard to find a nice playing one. I get it though…as you said…low demand is why there is low supply. There’s no incentive (both then and now) for them to produce lefties if they don’t sell them. It’s pretty much a custom order type of situation if you want anything nice. Of course in the used market, the hunt for them is half the fun! 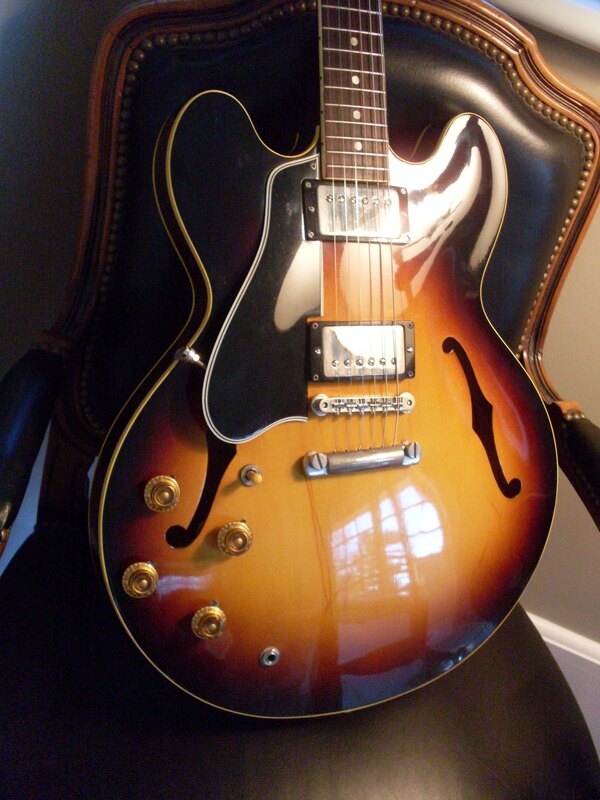 Keep us posted if you ever come across another vintage 3xx lefty! 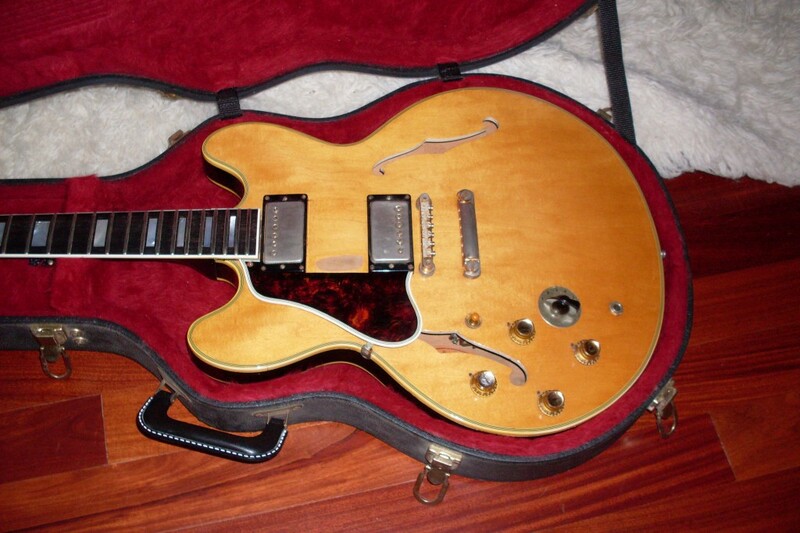 Wow, beautiful and crazy rare ’58 lefty dotneck but it just looks wrong to me! Maybe Sir Paul should buy it! He certainly has the coin! As a lefty I was encouraged by my first teacher to simply play “right handed”. Glad I took his advice. It’s advantageous for a lefty to put their writing hand on the fret board anyway because of the dexterity and control learned from writing. My guitar mind was completely blown watching Eric Gales play various Strats and Les Pauls from about 10 feet away on a Bonamassa blues cruise two years ago. I may have been the one who asked about lefties. I have a few righties flipped and restrung (like hendrix) but I can also riff around for awhile on a full righty held lefty(like albert king) but chords never sound proper. Strats and ES3xx flip very well, I prefer the feel of a flipped strat to a lefty strat (I suspect hendrix felt the same because he could have certainly gotten all the lefhanders he wanted and he never bothered). Teles, LPs and surprisingly SGs are impossible, your forearm WILL turn the knobs down on them while strumming, on a strat taking off the volume knob prevents that problem. Fortunately this does not happen on my ES345, to do the flip I just made a new nut, and adjusted the intonation, no other alterations not even the strap button, the low E just about a hair off, but the rest intonate fine. I remember Hendrix saying that the only reason he played right-handed guitars reversed was that the left-handed guitar output was less than 5% (surprised it’s that much) so the chances of finding a good left-handed guitar were correspondingly reduced. At that time, I thought all Strats (for example) were as good as one another, shows how much farther ahead of the game he was! Great article. Part of the problem of being a lefty is the lack of good vintage selections as you mentioned and when you find something…you do pay the premium for sure. The fun side is the search as you make it a fun hobby. I love old Gibson’s and Guild’s. Pictured are a ’61 Guild Starfire III, ’65 Guild Starfire V and a ’66 Guild Starfire VI. 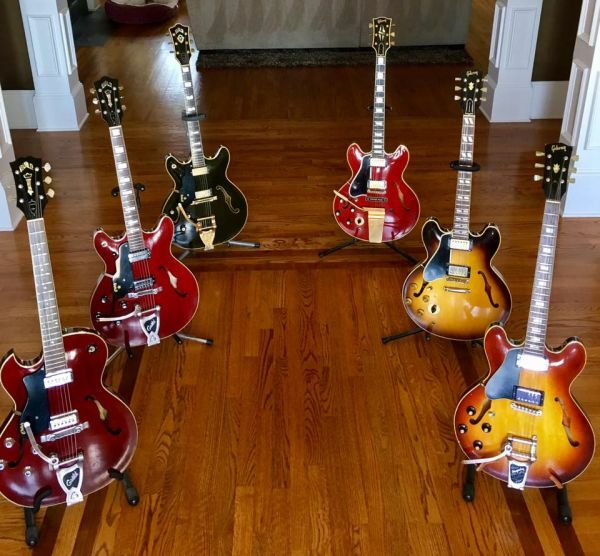 On the right ’69 Gibson ES-335, ’61 Gibson ES-345 and a ’64 Gibson ES-355. I’m a lucky guy to have these !